Authorities enacted a mandatory evacuation for between 100 and150 homes in the area, but most people have chosen to stay, according to the Mayor’s Office of Emergency Preparedness. If any of the dangers seem to become more imminent, the order will be escalated to a forced evacuation. 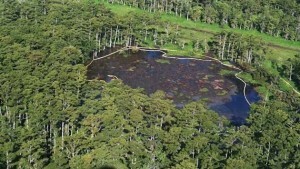 “NEW ORLEANS — The mysterious bubbling swamp in Assumption Parish that turned into a sort of soupy sinkhole actually shut down a nearby highway this weekend. About 100 homes were evacuated when the sinkhole started spreading. It caused cypress trees to topple and even bent a natural gas pipeline. That’s when officials shut down Highway 70, and started work to depressurize the pipeline. Thanks for the info. I have never used Safari, I’ll have to check it out. I publish THEI using Chrome. The foundation is WordPress although it is not a WordPress site.